This was my first foray into slow-cooker meal preparation. Just about everyone I know received one or more when they got married. I didn’t register for one because I couldn’t see the need. I still don’t think that it falls in the “can’t live without it category”, but I can tell that I’m really going to enjoy this “set and forget” form of meal preparation. While I was chopping vegetables, defrosting chicken and measuring ingredients this morning I thought to myself “What’s the point? I have to do all this prep work when I make dinner on the stove top.” But then I loaded everything in the slow cooker, set the temperature and walked away. It was at that moment that I realized I was really going to like not having to babysit the stove. I consider myself very fortunate, in that I work from home most days. Since I save time by not commuting, I often have ample time to prepare dinner. Just because I have time to hang out in the kitchen in front of the stove, doesn’t mean that I need to! I picked up a 5.5 quart Rival Crock Pot at Target using a gift card from Christmas. This is the gift that will keep on giving. My model is very basic, but manual controls make sense because I am home all day. This is only my first recipe, but I think the size is just about right. Even though I only cook dinner for two people, I like to have leftovers. 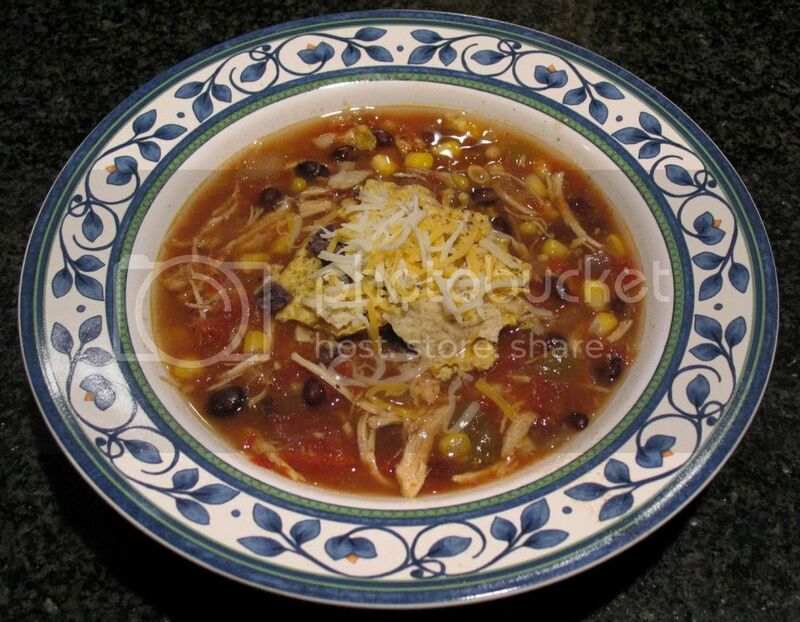 My friend Carolyn sent me this recipe for Chicken Tortilla Soup after she tried it and loved it. I followed her recommendations of adding a can of drained and rinsed black beans, and adding 2 raw chicken breasts to the pot and allowing them to cook in the soup. I shredded the chicken shortly before serving. Since I didn’t have a can of whole peeled tomatoes or enchilada sauce in the house, I made my own substitution. I mixed a 28 oz can of crushed tomatoes with some honey, garlic powder, cumin, cilantro and poultry seasoning and use this blend in place of the tomatoes and enchilada sauce. I also used half chicken broth and half vegetable broth so I could try some of my home made stock. This soup was SO good! I served it with crushed tortilla chips and a sprinkling of Mexican blend cheese. My husband said that it reminded him of Panera’s Chicken Tortilla Soup. It was warm and hearty with a nice kick. The original recipe states that it yields 8 servings, and I think that’s pretty accurate. We’ll probably have this again for dinner and lunch and then freeze the remaining portions. 1. Place raw chicken, tomatoes, enchilada sauce, onion, green chiles, and garlic into a slow cooker. 2. Pour in chicken broth, and season with cumin, chili powder, salt, pepper, and bay leaf. 3. Stir in corn and cilantro. 5. Before serving, remove chicken breasts and shred. Return shredded chicken to pot and allow to heat through before serving. It was Panera’s Chicken Tortilla Soup that encouraged me to look for a recipe! Glad you enjoyed it.